We’ve known for years how social media and Web 2.0 have been transforming the way political campaigns are run, the way we interact with big institutions, the way news is reported and distributed — indeed, practically all facets of modern society. So it comes as no surprise that social technologies are slowly transforming the way government works. What is surprising is that editors Daniel Lathrop and Laurel Ruma and O’Reilly Media have managed to make a potentially wonky topic like Government 2.0 accessible, fresh and actually interesting. 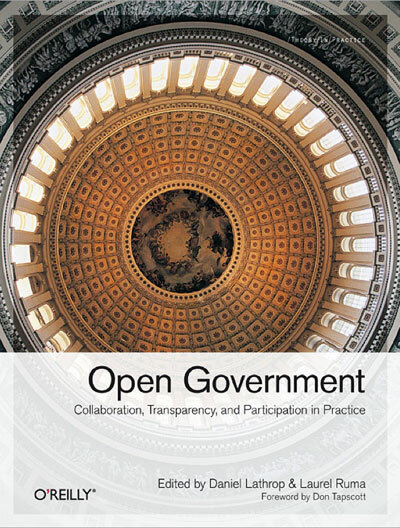 Open Government: Collaboration, Transparency, and Participation in Practice is a big (432 pages), beautiful book, from the gorgeous, sumptuous cover to the breadth of ideas and angles inside. In its collection of 34 essays written by thought leaders and practitioners in government reform, the book offers dozens of examples of a new approach to government: open, democratic, distributed, bottom-up, shareable, data-driven and focused on making “we the people” a reality again. Tim O’Reilly, CEO of O’Reilly Media — the best computer book publisher in the world — carried the same message in a webcast today that proved so popular my browser crashed four times. O’Reilly has been at the forefront of the open government movement and contributes the key second chapter, “Government as Platform.” O’Reilly Media co-produces the Gov 2.0 Expo, coming May 25-27, and Gov 2.0 Summit on Sept. 9-10, both in Washington, D.C.